The Afrotheria is a group of mammals, (a superorder or a clade). 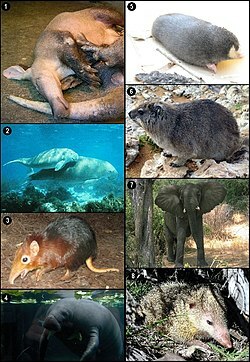 It includes the golden moles, elephant shrews, tenrecs, aardvarks, hyraxes, elephants and manatees. Biologists made this group based on RNA sequence analysis. Afrotheria are one of four major groups in the Eutheria (placental mammals). Afrotheria means "African animals", "afro" for Africa and "theria" for animals. More recent genomics suggests that Afrotheria and Xenarthra are sister taxa at the base of the placental mammal radiation. Relations between the various afrotherian orders are still being studied. Elephants and manatees seem to be related, and likewise elephant shrews and aardvarks. These findings are compatible with the work of earlier anatomists. Afrotheria is a clade of placental mammals. Order †Ptolemaiida: poorly understood carnivorous mammals (extinct). Wikispecies has information on: Afrotheria. ↑ Svartman M. & Stanyon R. 2012. The chromosomes of Afrotheria and their bearing on mammalian genome evolution. Cytogenet Genome Res. ↑ Simpson G.G. 1945. The principles of classification and a classification of mammals. Bulletin of the American Museum of Natural History 85: 1-350. ↑ Tabuce R; Asher R.J. & Lehmann T. 2008. Afrotherian mammals: a review of current data. Mammalia 72: 2-14. ↑ "Afrosoricida". Mammal Species of the World, 3rd edition. Retrieved 17 March 2014. ↑ McDowell, S. B. 1958. The Greater Antillean insectivores. Bulletin of the American Museum of Natural History 115: 115--213. ↑ Seiffert, Erik R (2007). "A new estimate of afrotherian phylogeny based on simultaneous analysis of genomic, morphological, and fossil evidence". BMC Evolutionary Biology 7 (1): 224. doi:10.1186/1471-2148-7-224. PMC 2248600. PMID 17999766. http://www.biomedcentral.com/1471-2148/7/224. This page was last changed on 28 November 2018, at 20:42.